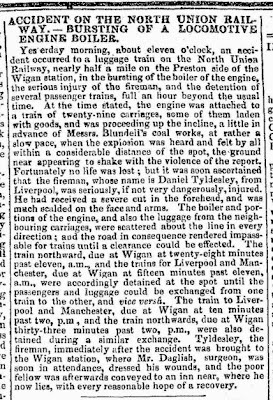 Yesterday morning, about eleven o'clock, an accident occurred to a luggage train on the North Union Railway, nearly half a mile on the Preston side of the Wigan station, in the bursting of the boiler of the engine, the serious injury of the fireman, and the detention of several passenger trains, full an hour beyond the usual time. At the time stated, the engine was attached to a train of twenty-nine carriages, some of them laden with goods, and was proceeding up the incline, a little in advance of Messrs. Blundell's coal works, at rather a slow pace, when the explosion was heard and felt by all within a considerable distance of the spot, the ground near appearing to shake with the violence of the report. Fortunately no life was lost; but it was soon ascertained that the fireman, whose name is Daniel Tyldesley, from Liverpool, was seriously, if not very dangerously, injured. He had received a severe cut in the forehead, and was much scalded on the face and arms. The boiler and portions of the engine, and also the luggage from the neighbouring carriages, were scattered about the line in every direction; and the road in consequence rendered impassable for trains until a clearance could he effected. 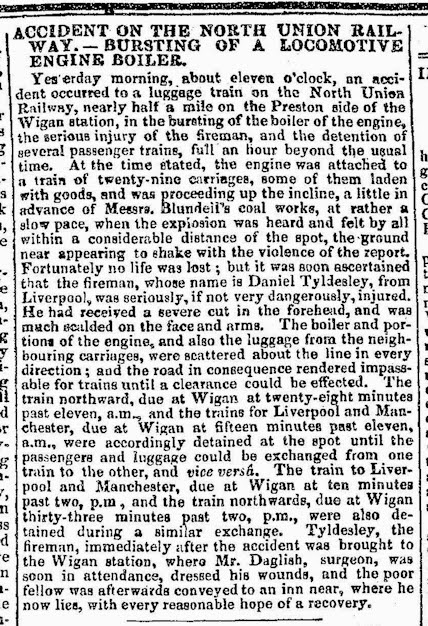 The train northward, due at Wigan at twenty-eight minutes past eleven, a.m., and the trains for Liverpool and Manchester, due at Wigan at fifteen minutes past eleven, a.m., were accordingly detained at the spot until the passengers and luggage could be exchanged from one train to the other, and vice versa. The train to Liverpool and Manchester, due at Wigan at ten minutes past two, p.m, and the train northwards, due at Wigan thirty-three minutes past two, p.m., were also detained during a similar exchange. Tyldesley, the fireman, immediately after the accident was brought to the Wigan station, where Mr. Daglish, surgeon, was soon in attendance, dressed his wounds, and the poor fellow was afterwards conveyed to an inn near, where he now lies, with every reasonable hope of a recovery.